The Scottish National Party is calling for an RAF airbase in Moray to become the UK's first commercial spaceport. The party's Westminster leader, Angus Robertson, wants Virgin Galactic to use RAF Lossiemouth in his constituency as a base for space tourism. The base has already been identified by Virgin as a possible location for a commercial space enterprise. "The prospect of space flight from Scotland is a serious and exciting one," Mr Robertson said. Virgin Galactic's mothership, which will be used to launch tourists into space, took to the skies over California on Sunday, and the test flight was watched with interest in Moray. The airbase is more used to accommodating rescue helicopters and Tornado jets, but Mr Robertson thinks there is also room for spaceships. 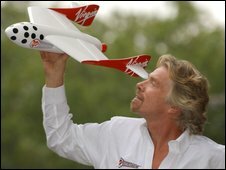 "Virgin Galactic proposals are an iconic and inspirational opportunity, which would bring technology investment, jobs and tourism, as well as science and educational opportunities," he said. "I am keen to meet with the science and innovation minister, Lord Drayson, and discuss in detail how this cutting-edge project can be taken forward. "It would be a mistake to underestimate the tremendous potential of these flights which will probably also launch satellites into orbit, as well as offering tourist flights into near Earth orbit." Speaking earlier this month, Virgin Galactic president Will Whitehorn said wealthy space tourists could be blasting off from Lossiemouth within five years, but another Scottish airbase and one in south west England were also suitable.